Welcome to Part 4 of the Top-Down RPG Shooter flash game tutorial. So far, we’ve set up the project, and added a player that moves with the arrow keys and rotates to face the mouse. In this part, we’re going to add bullets which the player can shoot by clicking and holding the mouse down. Create a blank Actionscript 3.0 file (using File –> New… –> Actionscript File), and save it as “Bullet.as” in the same folder as your other project files. Start out by typing or pasting this block of code into Bullet.as. I included a bunch of comments in there to walk you through it. Put all of these lines inside the bottom of the loop function in the Player.as class. Welcome back to the second part of my “Top-Down RPG Shooter” flash game tutorial. In the last part, we set up a new project and linked it to an external Document Class, and we added the Player to the stage. In this tutorial, we’re going to program keyboard controls to move the player. We are going to make use of a really great open-source class called “KeyObject.as“. This class was written by a talented developer named senocular. It provides a really simple but powerful way to check which keyboard keys are pressed. How do we use this class? Basically, we’re going to create an instance of it called “key” in our Player class (or wherever we need to access the keyboard controls). Then in that class, we can check the Boolean value of the keyObject’s isDown() function for specific keys. We can refer to keys by their unique keyCode. For example, if key.isDown(65) returns true, it means that the “A” keyboard key is currently being pressed. Hello everyone! If you’re reading this, that means you haven’t given up on AS3GameTuts, despite my year-long hiatus. Thanks for your patience! Today I’m going to start up a brand new tutorial series that I’m really excited about. How to make a top-down RPG shooter game! This tutorial is going to be slightly faster-paced than my previous tutorials. If you haven’t programmed before, I’d recommend starting with my Pong series, and then proceeding with the Platformer before you attempt this. We will be coding using AS3 in external .as files, instead of using the timeline. What is a Top-Down RPG Shooter? Personally, I think this is a pretty awesome game genre. I find these types of games to be genuinely fun to play. Our game won’t have a scrolling map. Instead, our map will be built from a series of screens that the player can walk through. When the player walks off one edge of the screen, the map will flip to the next screen. 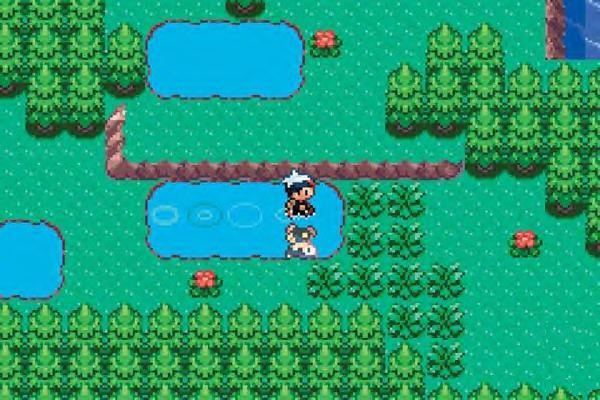 Pokemon Ruby and Sapphire feature great tile-based top-down maps. Hey everyone, I know I haven’t personally written a tutorial in awhile, but I’m planning on writing a few in the upcoming months. I want to make sure I cover the material that you would all most appreciate. This is your chance to let me know what you want to learn. If what you really want to learn isn’t on this list, or if you want to vote for multiple answers, just leave me a comment. Personally I’m leaning towards the top-down shooter, because I’m getting a bit bored of the other series — but if you all vote I promise to go with the winner. As I announced in the last post, I am extremely busy right now. Luckily for you, a member of the community has already stepped up and written a Part 13 for this side scrolling tutorial! In this tutorial, you’ll learn to create “bumper” objects for your enemies to interact with, which will let them patrol back and forth. You’ll also look for collisions between the player and the enemies, so you can take damage in your game. Cool! Ben covered creating enemies and making them disappear when they’re shot in lesson 12, so in lucky lesson 13, in this guest tutorial, I’ve picked up where the last lesson left off in the side scrolling platform game. This will cover making the enemies move, how to block them in so they’ll patrol in a simple side-to-side motion, and have them interact with your player if they touch you. Following in Ben’s footsteps, if I had to choose between making the code readable or making the code ultra efficient and take up the least amount of lines, I tried to make the code as easy as possible to understand. If you’ve followed the tutorial steps so far, you’ll find that creating the bumper class is very, very similar to the other classes made so far. For the artwork, I just made a square that was about a 25×25 pixels in size. I created this block on the background layer outside of what the player screen shows when you’re running the game. We’ll go back and made the blocks transparent later, but for now I’d recommend making them easy to see to help placing them on the screen from our code. Hi everyone. Thanks for sticking with the site and forum, despite my lack of activity. I think you deserve a bit of an explanation about my recent disappearance. I started programming when I was 13, using MIT’s revolutionary software, Scratch. Five years later, thanks to an amazing online community of teachers and tutorials, I’ve worked on many Flash games, I’m a professional iPhone/iPad app developer, and I’m currently sitting in an MIT dorm, getting ready for my freshman year to begin! It’s been quite the ride of teaching and learning to program over these 5 years! Needless to say, the transition to college is a big one, and my free time has dwindled. I expect my workload to be intense, and therefore I can’t commit to being very present on the site and forum in the near future. I wish I could say this is the end of my hiatus, but I can assure you that I haven’t abandoned AS3GameTuts. I’ll try to check in every once in a while, and keep the site up-to-date. If you want to contribute to the site in any way during my absence, feel free to reply here, send me an email at as3gametuts@gmail.com, or send me a message on the forum. Perhaps you’d like to write a guest-post tutorial, or you’ve assembled a group of links, tips, news, etc that would be helpful to post on the site. Honestly, I’m not making any money off of the site (I’m actually losing a few dollars per year for the domain name). The site is my way to “pay it forward” to a community that has given so much to me. If you’d like to contribute to this effort as well, let me know (don’t worry, I’ll give you credit/rights/etc to any content you contribute). And hopefully after a little while I’ll settle into a good rhythm and perhaps have the time to start writing full-length tutorials again!